Throughout the history of mankind, I do wonder whether there are more reluctant brides than grooms at the altar. What do you think? 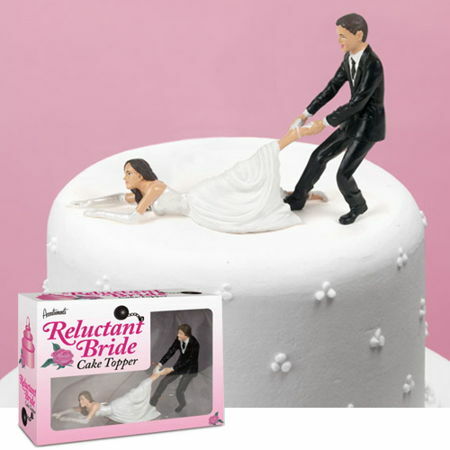 If you know the couple that is about to get married really well, as though they were your own family, then it might be worth playing a prank on them with the $17.99 Reluctant Bride Cake Topper. Turn a wonderful celebration between two people and their respective friends and families into an occasion where there can be even more laughs, as some brides do require more than just a huge diamond ring to walk down the aisle. Made out of polystone, the Reluctant Bride Cake Topper measures 4.25 inches tall x 6.25 inches long.